On Saturday the temperature rose to a positively balmy +14 so we went to the beach. Of course, it’s not supposed to be that warm in February and we were not the only ones with the same idea! The place was pretty busy with people checking out the broken ice on the lake. This is Lake Erie, at Port Stanley. We walked out onto the lake, which is probably slightly dangerous. We went out to where there were lots of other people, although they aren’t in this photo, that’s just my husband and kids. Of course I took a bracelet along. My husband took pictures of his stuffed squirrel puppet for his Instagram account. Our children have come to accept their slightly eccentric parents. LOL!! 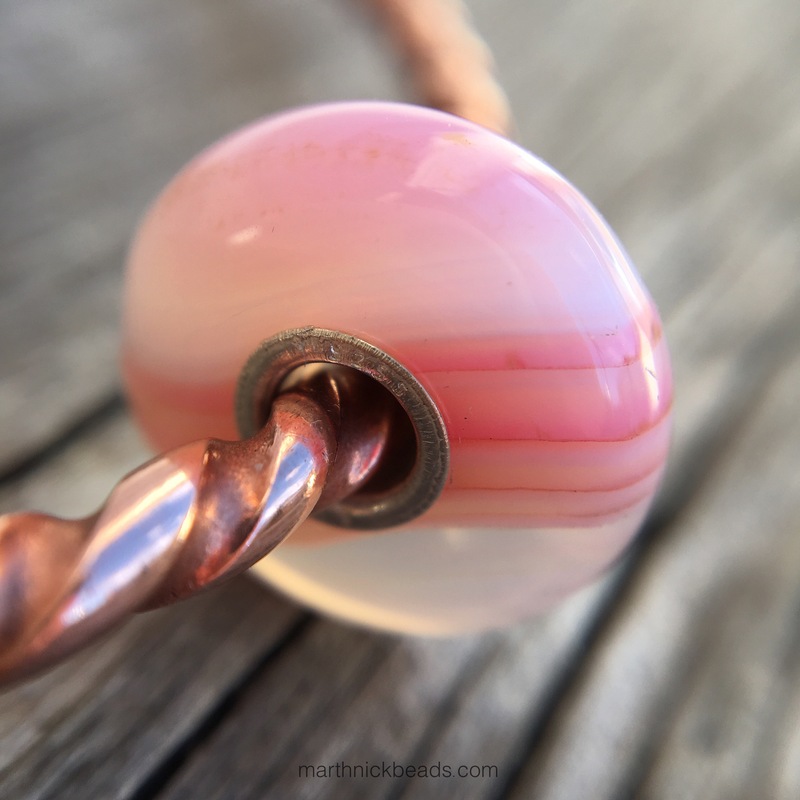 This is the Pink Striped Agate Kit and I love it! I bought it from Trollbeads.com. There are some striped parts and some solid parts so the beads look slightly different from different angles. I love how each one is unique. My favourite is the peach coloured one at three o’clock in the photo below. I used two of them with the Golden Cave in the middle, Sweetness on the left and Love & Laughter on the right. I did a few macro shots until I lost one under the back porch! Argh! My husband got a rake and helped to get it out. Phew! 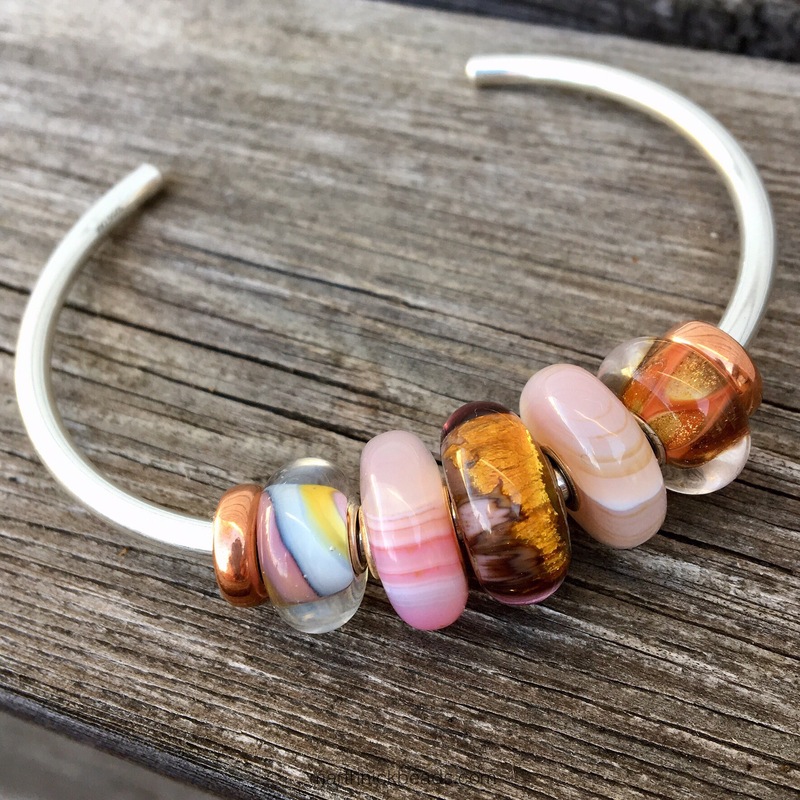 Here’s a simple bangle using these three. In the second photo I flipped the bangle over. The silver beads are the new Hourglass ones. 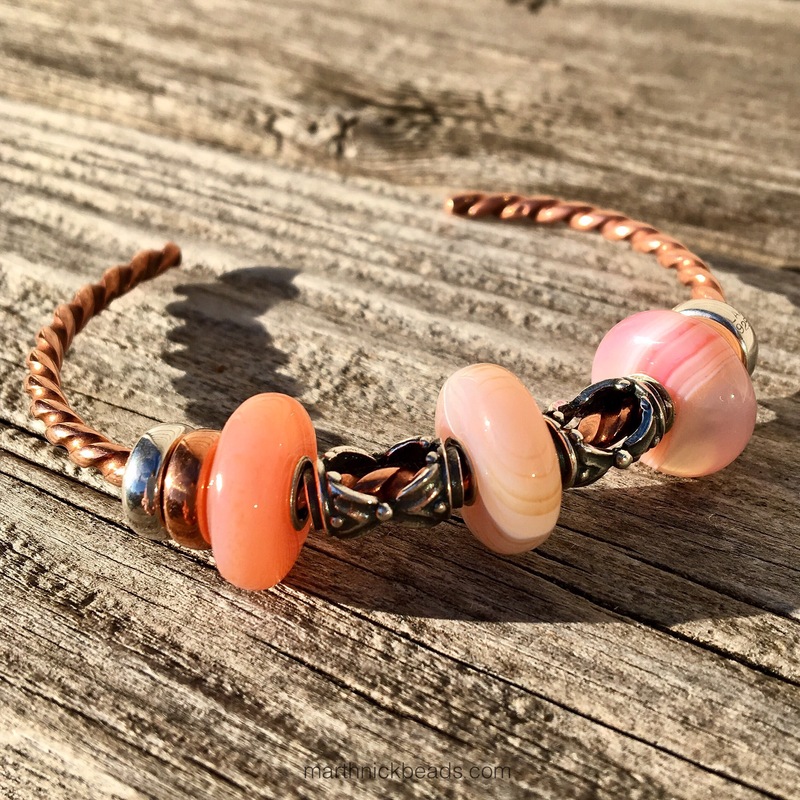 For a full combo I added in the Copper Twisted Bangle and the Copper Bangle with three Water Lily Spacers. It’s going to be so much fun having these beads in my collection. I’d had my eye on them for years, so am glad I finally bought them. There’s also a Turquoise Striped Agate Kit which I’m going to put out of my mind. 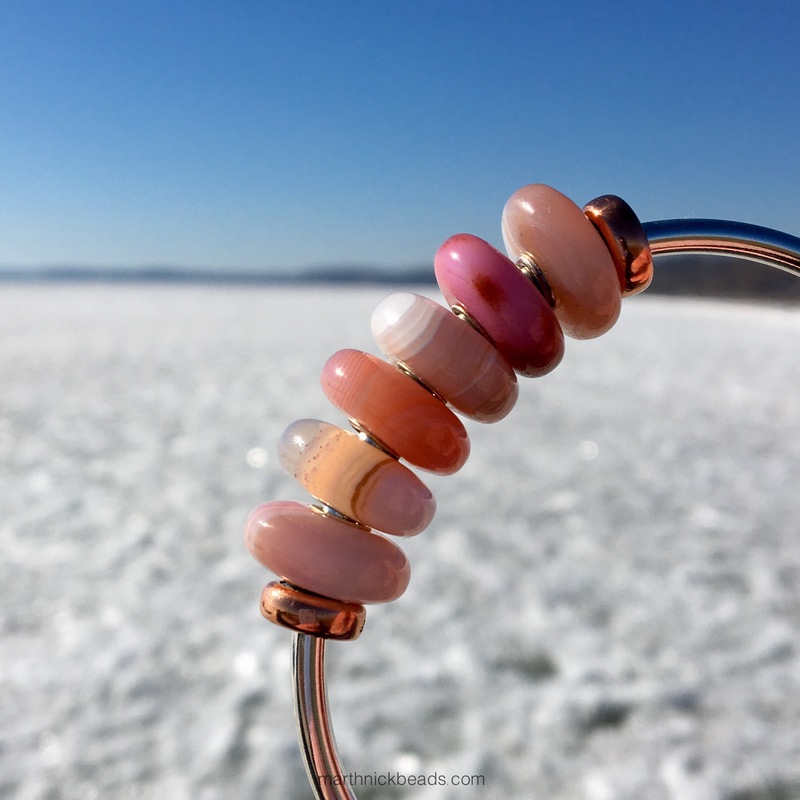 It is actually a good thing there is no store where I live that sells Trollbeads, because I could see stopping in all the time to see if they have pretty stones to buy! Is anyone else an agate fan? Or do you have the turquoise ones? It’s a gorgeous Kit, and your photos and combos make it oh, so desirable !Your macro shots show just how beautiful their individual striations and subtle colourings are. Are they dyed or natural stones? Your day at the lake looks like a great experience. 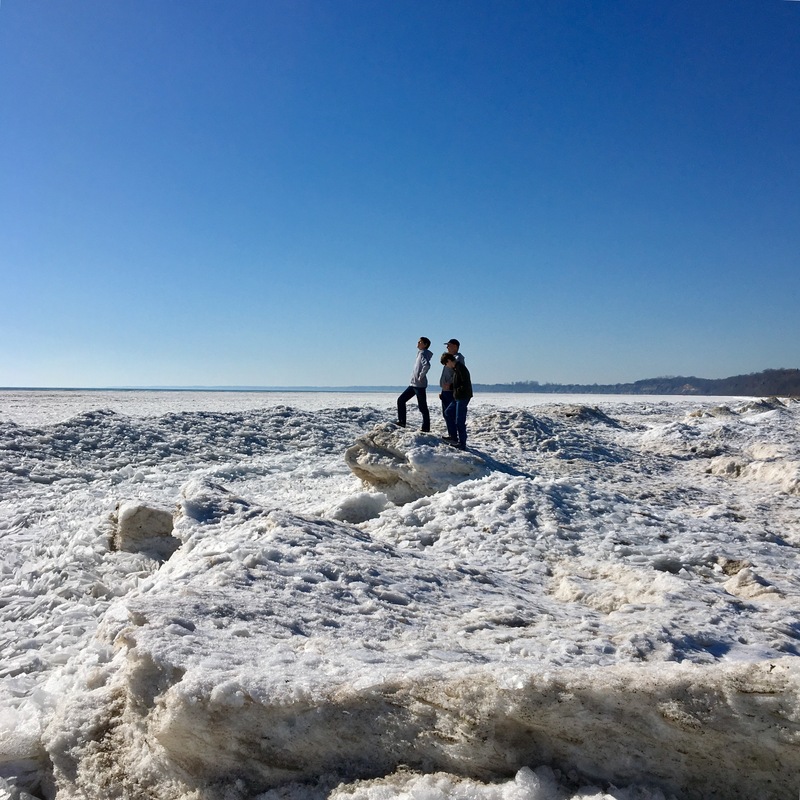 We usually go to Lake Huron to witness the winter ice because it is so close. I lived right on the shores of Lake Ontario for many years and wondered at the changeable views each and every day of the year. Those were the happiest years of my life and your evocative photos bring them all back to me this morning. 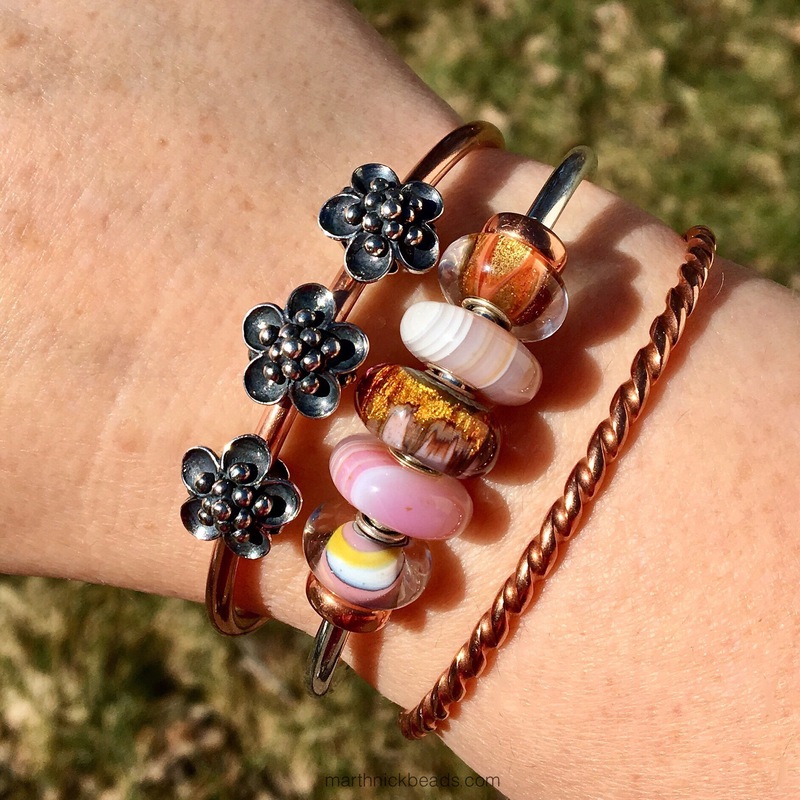 Thank-you for your beautiful post and amazing beads! Sarah, I’ve asked the British Trollbeads collectors about the dyed/natural question so when I hear back I’ll answer here. I don’t want to ask TrollUSA because it’s a holiday there and I don’t want to bug them, but I will find out eventually! The lake was so amazing and I can’t believe that at my age I’ve never seen the ice like that before. I guess I’ve just never thought to go to the lake in the winter! How fabulous that you used to live near the water. That’s truly a dream, isn’t it? Ok, one of the British ladies says they are dyed. I thought so, as so many agates are, but I think it really enhances their beauty. Hi Martha, First of all your pictures of the lake are incredible! Now for the beads… I love them!!! Turquoise, huh? Maybe I should make my list be the beads I don’t want… it would be much shorter!!! Oh well. Haha-having “eccentric parents”…those are the best kinds and your photos of the lake are amazing. 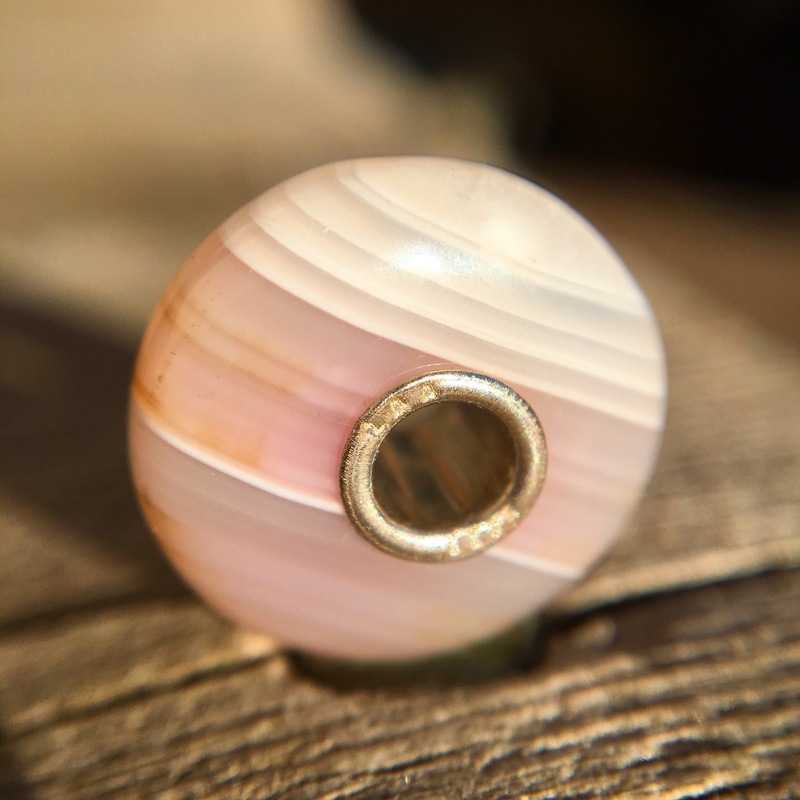 (I love to see what Scaredy Squirrel is up to;) These striped pink agates have such a soft, naturally beautiful quality to them. As a relatively new collector, I love to see these “older” beads featured to focus my collecting a little more. I have thought about the striped onyx and turquoise kits, but I think I would need to see them in person first. 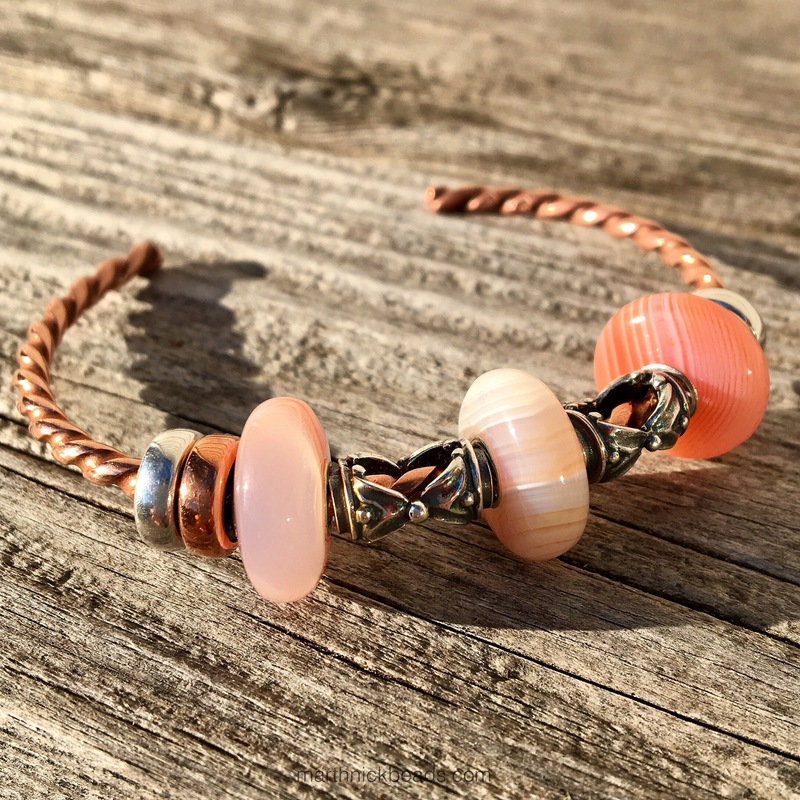 The pinks and peaches look very versatile and work beautifully with copper and the new glass beads. Thank you for showing us! Hi Tanya! I consider myself to be a relatively new Trollbeads collector also and have a lot of catching up to do. They have such a rich catalogue of items. Most of my collection is glass and there are so many lovely silver beads to look at also. I must save up some money for going to the NYC store, because that would be a great place to pick up some more stone beads! Hi, Martha! 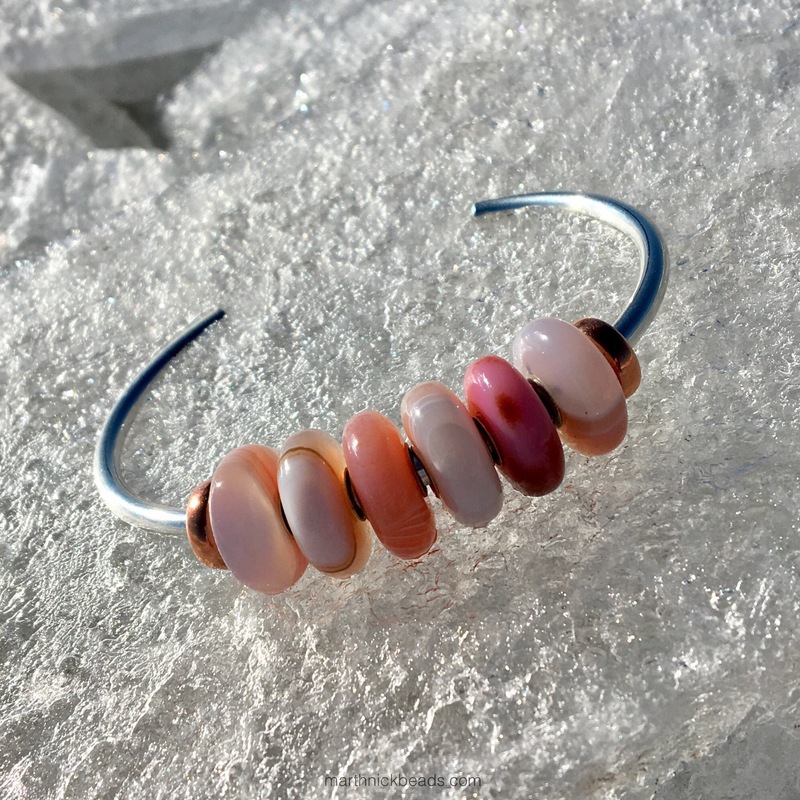 I, too, am a fairly new bead collector (since Feb. 2016) but have loved jewelry all my life and have been making jewelry for 40 years, starting in my teens. I especially like natural stones, and those pink agates are to die for!!! I do have a Trollbeads store in my town, which has been hard on my budget lol. Love your blog and beautiful photos. We live just 20 minutes from Lake Michigan. 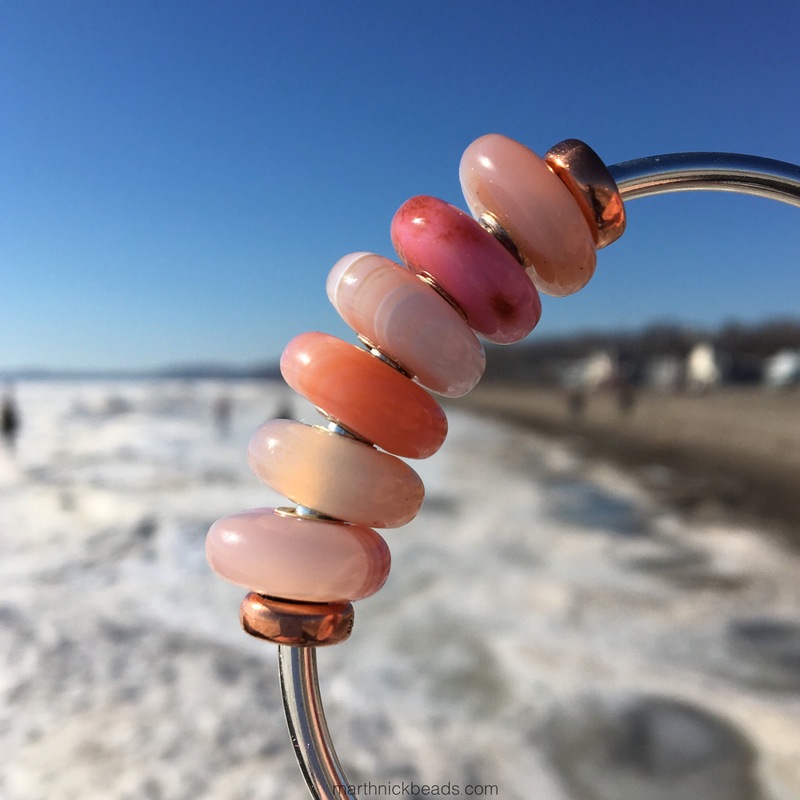 Do you find beach glass where you live? Hi Kat! To be honest, I’ve never really seen beach glass on the shores of Lake Erie, but I also haven’t really ever looked for that specifically. I will do that in the summer! How nice to live close to Lake Michigan. We went to a really nice beach town once. I think it was called St. Joseph? Love the photos, especially of the lake! I live near Lake Ontario, and have gone out a few times (not this year) when it’s been frozen like that. I should go out and see if it’s frozen this year, since we’ve had a pretty mild winter. Your agates are really pretty. I have 5 or 6 of the turquoise ones, which I bought at various times when I could hand-pick ones that caught my fancy. I think they’re among my favorite Trollbeads stones. Hi Kim! Yes, it has definitely been a pretty mild winter. Next time I’m at a store that sells Trollbeads (which might not be until the summer) I’m definitely going to look at the turquoise agates. I will look through your IG page to see if you have pics of yours there. I have two pink agate beads that I was able to select in person at a store. One is a lighter pink all the way around and the other is darker tones. I love your icy lake photos! 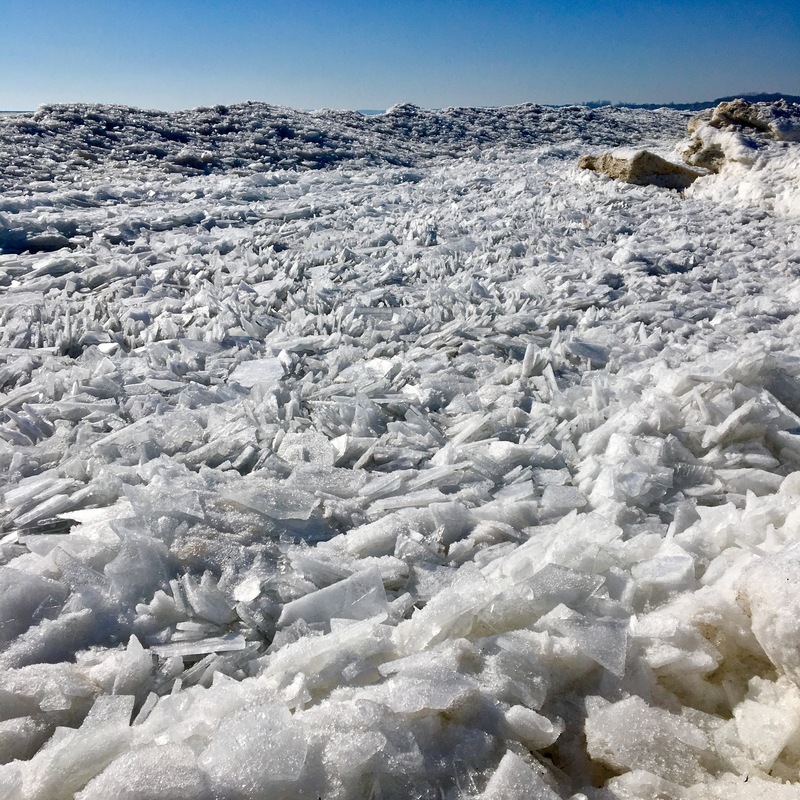 I live an hour and a half from downtown Chicago, my daughter lives in NW Indiana, and we used to ski in Northern Michigan so I’ve seen a few sides of Lake Michigan over the years. It’s beautiful in all seasons. What a fun and artistically inspired way to display the agates in the the shape of a flower using the chain, locks, and beads! Way to go, Martha! Thanks Dawn! The flower picture was a fun one to make. How nice that you live pretty close to Chicago. It’s one of our favourite cities. The architecture, the pizza, so fabulous! Chicago is a beautiful city. We enjoy visiting with our daughter and son-in-law as they know their way around whether walking or riding the trains. All we have to do is follow. We did the Architectural Boat Tour and some of the annual building tours last time there. 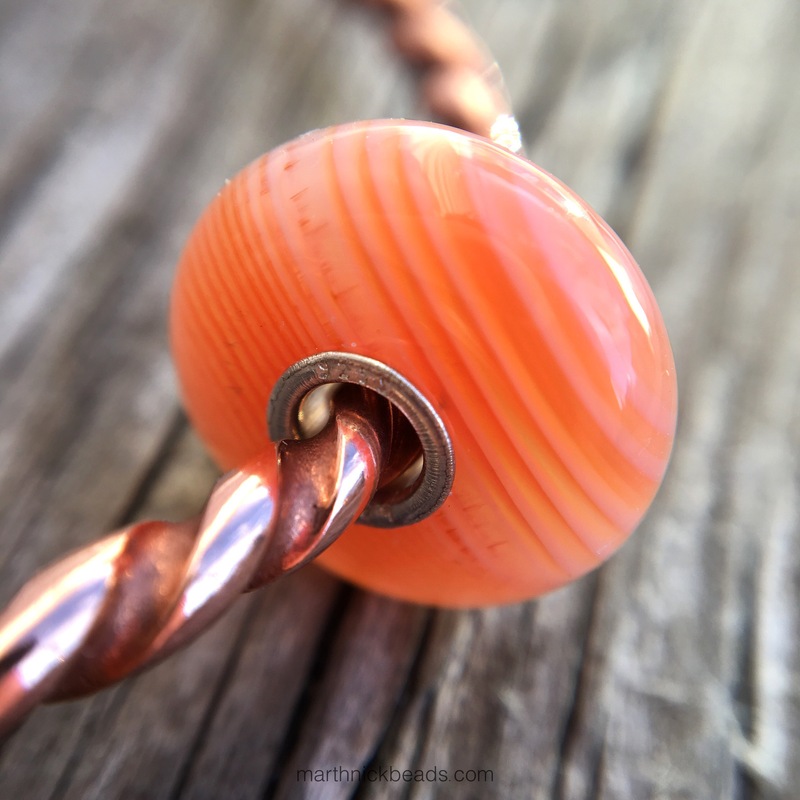 Just to end on a bead note, I have to get a Water Lily Spacer soon!